You are not too sure what your place in the world is yet. You often feel invisible in a crowd. You are more expressive than most people. You let everyone know how you're feeling - the good, the bad, and the ugly. You are a very passionate person. You are highly charged and easily inspired. You are an assertive person at times. You'll pull out all the stops to get what you want, if it's worth it. You don't fall in love easily. It's hard for you to connect to people, and you don't have many attachments. You are not afraid of anything. You are brave and courageous, even when most people would be terrified. You are intellectual and philosophical. You are more concerned with thoughts than action. You are an amazingly hard worker. You aren't spoiled and you don't mind getting your hands dirty. You are easily influenced by other people. You're quite impressionable, so you should only be around people who are a good influence. I saw this post in Lerma's blog, I hope she doesnt mind, but sharing this to others who are also interested really means a lot. So, why dont you check this site. Happy earning then! Here’s the 53 ways to make money on the internet by Edith Yeung http://www.edithyeung.com/2007/04/26/ways-to-make-money-on-the-internet/ . I have been teaching about IT for several years but I didnt really put much attention on blogging. Perhaps my time in work and in the family were all consumed if not drained. 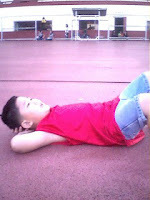 But, when I moved to General Santos City, I was all bored of the laid-back life here with no work to go to. So, blogging kills my time. Funny eh. . . But, I love that I am back into writing again. I have been writing since elementary, but I stopped when I had my Yuri. But, now that I am all away from everyone in Zamboanga City, and from the person who betrayed me, I am back with my writing and love it! Geez, why was I not told that you have to have time for yourself too! hahahhahha I love to meet new friends and just customize my blog and just post about friends, family, nature and all. . . . So, whoever invented, designed and everything about blogging, my hats off! It has been raining for days here in General Santos City. We welcome it much because of the extreme heat here. My son has to take a bath at least 3 times to cool him off. . . . Sometimes we are too busy chasing our dreams, looking for the the love of our life, that we tend to ignore little things we can also appreciate. 19. and just blog about other little things I should be happy about. . . . . .
We really dont have to have riches of the world, or all the academic titles famous schools could offer, or trophy partner to show off . . . . Happiness can still be found from simple life's essence that we oftentimes ignore. . . When does exactly love becames its real name and not something else? Is it defined by giving your whole life to the person you claim you love or by also respecting your very own self in the process. When does it become a reason for others to abuse and betray you? I only know that love is beautiful in spite of life's struggles, in spite of injustices, that love can still be shared even if your very own loved ones hurt you. But when does self-love begin? I must say self-respect must start first within so others will treat you with that utmost respect, then perhaps real love can persist. 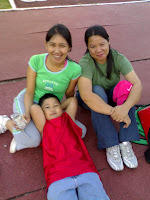 When I started my regular jogging in Zamboanga City, it was purposedly done to just hang around with other joggers. But, as you run longer, as you push harder, you will realize, this isn't done to please others or to simply acquire that gorgeous curves. It is being done, so you may feel that you are alive, so you may feel that beauty is still around you as running becomes more tedious like the way you run your life. I had went through rough hurdles in the course of friendship, romance, family and work. I would look for solace and comfort through bad friends and bad influences. But, never really I found the tranquility I had been wanting. As I pushed myself for more turns in a square-type jogging arena, I felt my heart throbbing faster and my muscles more constricted. But amidst this, my mind was all clear of any ill feeling of being a broken spirit. I wish as I jog more, I can find peace more; I wish as I jog longer towards my finish lines, I can find longer strength and endurance to move on with life; I wish as I jog regularly, I can constantly find beauty for feeling and living life with my family around me and for being part of this grandious universe. 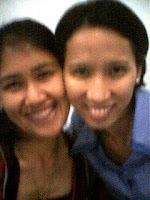 Working since my college days has made my summer '08 in General Santos City, Phil. difficult. Perhaps, waking up early, doing the job I love, and preparing for the next school's day fill much of my consciousness. All these are embedded deep in my system. 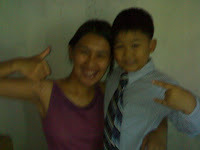 I am quite remorseful that I actually overlooked much of my duties as a mother to my son, Yuri. Although, I tried to compensate my absence in his everyday time, most especially after an 8-hour work. Perhaps, the lost time will take longer time to make up with him. I know it will never be too late to start anew with him, to have that quality time with him. 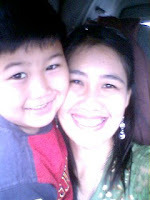 And, this I hope I can realize this summer, away from work, away from the things that keep my son and I apart. How do you classify one as a friend? Is it measured by the gifts he gives you on your days of celebration or by the praises he utters whenever you have new clothes, jewelry or latest gadgets at hand? Is it gauged by the number of phone calls, messages or mails you received in the course of your so-called friendship or his regular presence during moments of special celebrations or by the number of years your friendship is going through or by the lies he will make to cover your flaws and troubles? I must say, true friends are not measured by age, gifts, praises or by any superficial thing. True friends are the ones who accept you in spite of the your personality differences, who care for you in spite of your mental and emotional lapses, who love you in spite of the bad choices you make in your life. True friends are those who dont ask you to reciprocate their favors, or dont badmouth about you behind your back, or dont place borderline limits to your being friends. True friends are those who stick with you through thick and thin, through high and low waters, and heaven and hell. 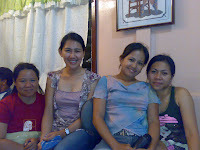 I will sure miss you my friends in Zamboanga City, Lourvic, Jane, Carol, and everyone I shared my heart with. Working and living away from my biological family was a tremendous struggle and had been a difficult burden. As a typical Filipina who clings much to her family, this is indeed a problem. But seven (7) years of working with same people and doing teaching, my first love, this burden was somehow alleviated. My co-administrators were my seniors in terms of age and experiences. Consequently, I looked up to them as my mentors but more importantly, my elder siblings. They taught me to handle my subordinates as an IT head, to relate with our client - the parents, the students, the partner academe and industry, and to face life as courageous and smart as possible. Our college dean, Dean Carmen Solis, has been a grandmother to me and to my five year old son, Yuri. She will never miss our birthdays. Thus, we always have a home-made chocolate or ube birthday cake (Yummy!!!!). Special occasions like Christmas, Valentines, and any other feast are celebrated like any other family joined by blood or laws. 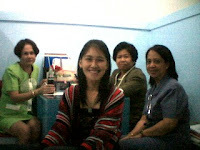 Ordinary and draining days were taken jovially with my co-employees around. Having one on an off-school seminar or training made my working hours dragging. Truly, I spent more time with them than my very own direct family. Now, that I am away from Zamboanga City and back to my biological family here in Gen. Santos City, I cant help by miss my friends-mentors, Maam Dolly, Maam Anne, Maam Joy and Lola Dean, of course, why would I ever forget, our beloved secretary, VJ. Hope to see you guys soon! Have you ever experienced what it is like to be amidst big trees, on top of mountains with vision of the city just beneath your eyes? The experience was splendid. You would realize how little could your problems be, how mediocre can your ill feelings be compared to the manificence of other mountains, the open ocean, and very blue clouds. You would feel alive and spirite revited again. The sweet smell of the grass, the warm touch of the wind, the sweet songs of mountain birds would make you realize that life can sill be beautiful in spite of its struggles. 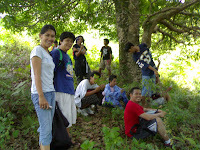 My climb to two mountains in Zamboanga City, PHilippines, with my friends, make a tremendous connection with nature. 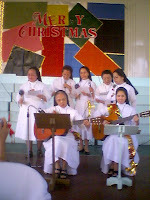 They reminded me that blessed are we to enjoy life at its humblest and wonderful feeling! I wish to climb more mountains and feel alive again!!!! When do we exactly say that love is true and unconditional? I must say, we can see this in the perspective of a mother to her child. It is when she has to endure the weight, and other physiological and emotional changes while carrying her child in her wom, the loving strokes she gave on her belly and unceasing prayers and wishes that may her child grow healthy and beautifully. It is when a mother has to wake up in wee hours in the morning to feed, to pacify, to carry her baby close to her bossom in spite of the deprived sleep. 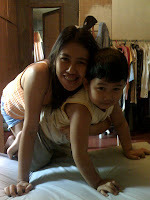 It is when the mother has to rush hurriedly to her ailing son and wish that she would rather feel the pain for her son. It is when she has to work of various kinds just to support the family, to support her child until he can stand on his feet. Her love and care is unceasing and unconditional that sometimes she forgets her very own needs, her very own self. 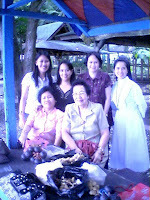 So whenever I ask myself, did I really truly render love to my family or to my loved ones, I feel short with my answers. Like the Bible says, Love has no bounds, I could only wish that kind of love can be given to me and be reciprocated. . . . . I salute all the mothers in the world who have given much in spite of how little they have. Teaching has been my first love since college. I love the satisfaction from the innocent smiles of my students but more importantly from the smiles of gratitude of the students of public schools we took in for our IT free trainings. It has been my dream to be a missionary lady but perhaps, this mission took a different medium through classroom teaching. And, this desire to help others has been my motivation and source to influence and to infect too some more young misssionaries through my students. IT Literacy in the Philippines is a privilege among public schools particularly for graders. 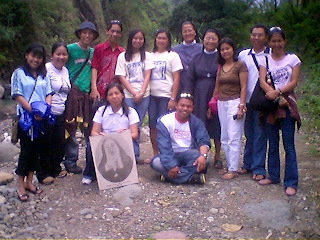 Consequently, since 2005, we ask our college students to help us in training basic computer operations among elementary students. We only wish we can train more; we only wish IT Literacy can be given a serious and continuing attention by our Philippine government. We have brilliant and talented Filipinos, but only a few are actually given the resources. Those who come from the least can only rely on the free trainings and other opportunities given by the NGOs and private institutions. I pray that othe good - hearted individuals or institutions can actually hellp promote and implement IT education among public elementary schools especially in remote areas in the Philippines. I must say their humble smiles are worth rewarding and fulfilling. Exercise has been a wish. I would always yearn to drag myself to the gym and burn those extra pounds. But, when I saw my friends in airsoft and how they sweat after a 15-minute game, I soon asked myself, can I make this my new hobby and burn my fats as well? Wargames are typically games for the big boys! I usually wonder how men can act you ng, feel young in playing with airsoft guns. Their full battle gear: masks, vests, pads, gloves and military uniform cant make them significantly different from real soldiers. Men of different ages and of different professions and line of works eagerly enjoy their Sunday afternoon games with their M14, M4, MP5 or their AKs. My bewilderment was soon answered when I had my first real wargame. I killed three (3) senior warriors within close range with my first AK. Every game since then makes my adrenaline high, heart and pulse throbbing. My airsoft gun, (now I own a Spetz), feels cold and heavy on my hand, I can only grip to it as tight as I could as if my life really depends on it. I have to dod ge, dive, crawl on the dirt to make clear, plausible shots. In a 10-minute game, you can feel your entire body sweat, your muscles tighten as you run, hide and aim at your opponents. I have lost 1 size smaller in just three (3) Sundays of wargames. Of course, it is not just about aiming or shooting, teamwork and strategies did the winnings. What makes the games fun but painful is the hit of the automatic fired bb's in a closer distance. Blood can trickle down from your soft skin. This I must say scare off other ladies to join. 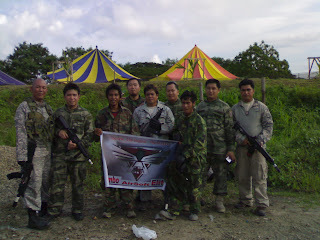 I applauded two other ladies who joined Zamboanga Airsoft team, which is dominated by hard-core men. But airsoft nationwide has made greater appeal even to women. 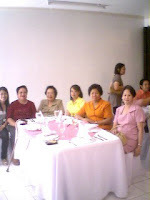 Lady celebrities in the Philippines join them too, together with their loved ones or friends. Not only that this game excites your adrenaline and your wits but it also improves your relationship with others and your perception about life, that it is a battle that you have to focus and put your resources/strategies in to survive. 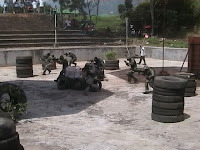 I will always love the fun and thrill of airsoft games!!!! Being a teacher for ten years is worth fulfilling, imparting your ideals and character all at the same time. You wont get tired to read and wait until you meet the faces of your students hungry for your new learnings. But apart from all the content that you teach, you dont actually realize, that they value more your enthusiasm, your love for them. You will see this from every smile and greetings you get whenever you meet them in and out of school. THe simple "I miss your class" from your old students can make you feel fulfilled, that indeed, teaching is something. I will always appreciate the teachers in us, teachers within our friends, family and ordinary people that we meet. People who teach us how to deal life and how to love it at the same time. We can never outgrow that teacher-feeling within, perhaps, until we grow old, until our students wont remember our names anymore, but only our smiles and the appreciation they give for the little things we taught them.